Amid our super-fast urbane lifestyle, the distance between city inhabitants and nature is increasing at an alarming pace. 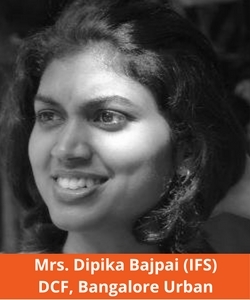 The widespread outcry about the rising air pollution levels must be addressed. In the name of green spaces, we are left with a few lawns and not-so-conspicuous green patches. Thank God, for Cubbon Park, which still stands tall as the city’s lung space. Having said so, considering the growing size of the city and associated traffic woes, those living in or commuting to and fro the fringes of the city are often left with little to no options. However, the Karnataka Forest Department (KFD) is out with a good piece of news! Under the purview and able leadership of the Deputy Conservator of Forests (Bangalore Urban), Mrs. Dipika Bajpai, alongside Mr. Harshavardhan, the Assistant Conservator of Forests, the Hennur Lake Biodiversity Park (situated at the Nagawara circle, right opposite Embassy Manyata Technology Park) has transformed itself into a beautiful 34-acre tree-park, making it the third largest urban park (after Lal Bagh & Cubbon Park). 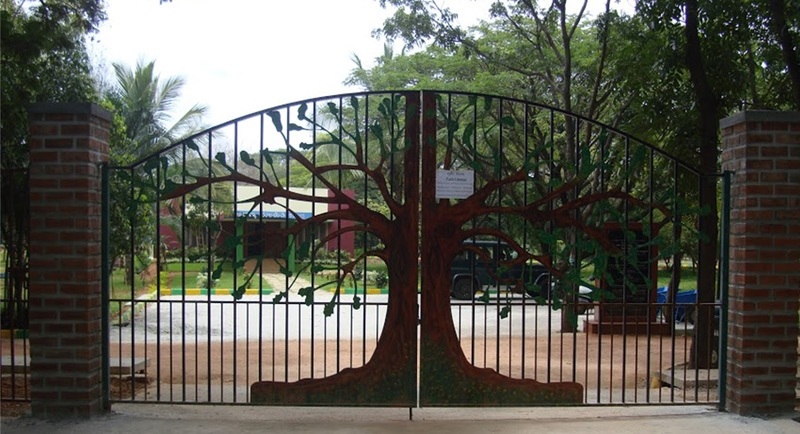 The Hon’ble CM of Karnataka, in his 2014 Budget speech, announced that the woodlot in Hennur tank area will be converted into an urban tree park to attract visitors, offer recreation to locals and offer a welcome break from the mundane concrete landscape. Over the last 2.5 years, large-scale interventions have been undertaken to convert the hitherto wilderness into a rich urban biodiversity park. The tree-park was inaugurated on July 15 2016 by the Hon’ble Chief Minister of Karnataka in the presence of several other dignitaries. A mud path of around 1.5 km run along the periphery of the park. 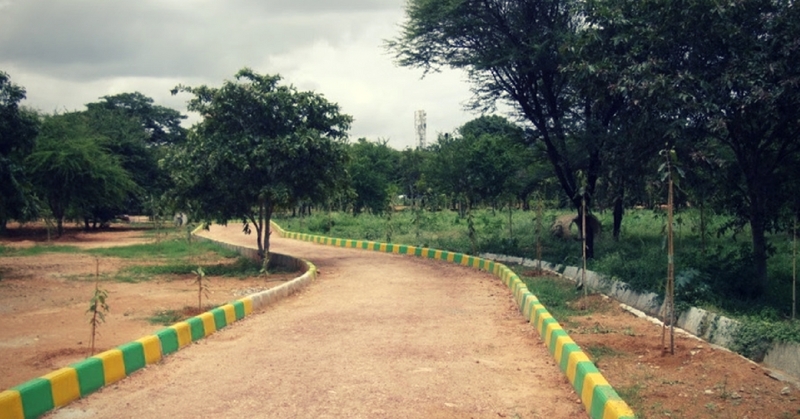 This path is unique in being one of the few tracks in Bangalore which can be used for athletics/sports training, as it reduces the incidence of knee/shin injury. This is also ideal for the elderly and children. 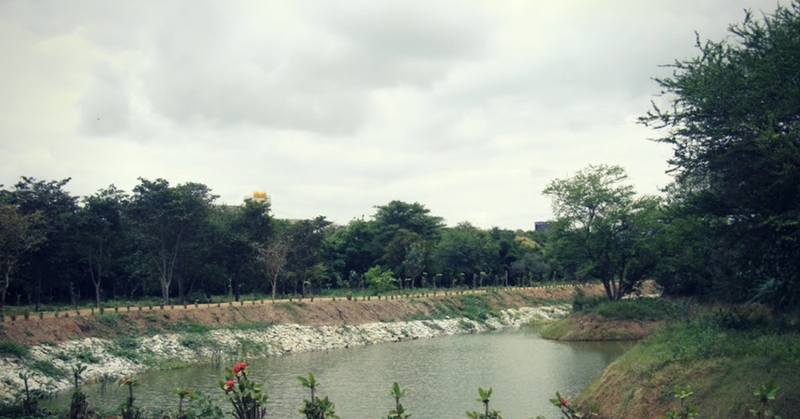 Two artificial ponds have been created in addition to an already existing pond, to harvest rainwater and in turn help in ground water recharge of the surrounding areas. These ponds also serve to attract birds. This will in future become a treatise for bird lovers in the background of a concrete landscape. Careful efforts to plant a maximum number of tree species have been undertaken, in order to enrich the biodiversity value of the park. Hundreds of species of trees can be found here. Also, efforts to bring tree species endemic to the surrounding states are on. 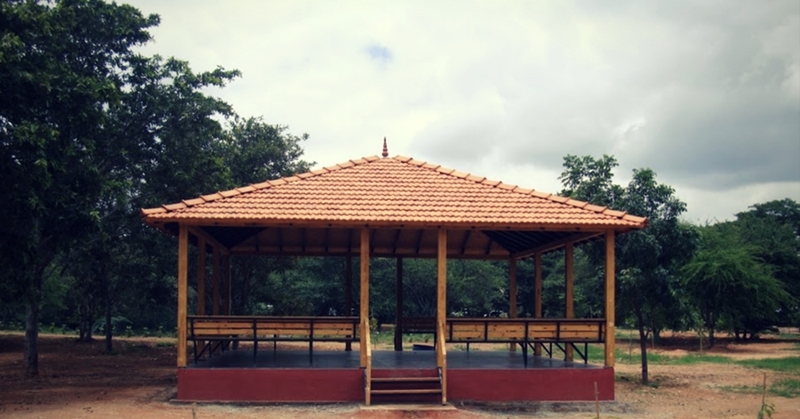 A Gazebo which can be used for awareness programs and outdoor activities, an RO plant for providing safe drinking water, a wooden toilet complex, a long row of medicinal herbs, an information centre with bulletins of the department, granite benches, dustbins etc. A storm water drain carrying sewage runs across the park, for which a sewage treatment plant of 1 MLD capacity has been sanctioned by the Karnataka State Pollution Control Board, which will be shortly implemented by the BWSSB. In the last one year of its development, there is a spurt in bird sightings of different varieties. Kingfishers have made their nests, slender lorises have been sighted, honey bees have made combs and a large variety of butterflies adorn the park. These developments are indicative of this healthy mini-ecosystem. This tree-park offers immense scope for further beautification and provision of more utilities to its users. KFD is more than keen to collaborate and converge with the private sector enterprises (especially those with establishments in Manyata Technology Park, overlooking the Outer Ring Road) to co-lead sustainable development of the tree-park and enhance its offerings to cater to more denizens and its own employee workforce. A Butterfly Biodiversity Park: A gazebo of 625 sq.m. adjoining one of the bigger artificial ponds is intended to be planted with specific host and nectar plants suited for different butterfly varieties. Butterfly enthusiasts can use this space for study and repository creation. The goal is to nurture over 80 indigenous varieties of butterflies for research and recreational purposes and create a biodiversity hotspot while offering an ideal natural habitat for learning, relaxation and photography. Fishes of different varieties shall be induced into the pond, which would attract birds. Installation of Walkway LED Lighting along the paths running inside and through the park: This shall enhance security and operating hours of the park while enabling joggers and walkers to stay longer, even after 6.30 PM. The plan is to install one light at every 100 m distance along the 2 km trail and 5 in the nursery bed area. An inclusive play area for children with all amenities: Using modern and innovative equipment, which tickle and appeal to the cognitive, sensory and other abilities of the young ones (also those with disability, autism, dyslexia etc. ), the goal is to develop the 2-acre area into an inclusive learning area where children develop their cognitive skills through out-of-the-box play structures. This would be the first-of-its kind play space, the nation has ever seen. Interactive boards and signage: These will serve as an outdoor classroom, helping in the identification of trees, their utility and more information about butterflies and birds. A green litter compost unit: This will shred and compost the fallen dry leaves and branches in the park, which is otherwise burnt traditionally. Treehouses for birds and much more! Cities are meant to develop, there is no denying that. However, we ought to use a little more ‘ecological sense’ when modifying our landscapes or adapting to modifying landscapes. And this is a humble attempt of the very enterprising Forest department and the officials-in-charge to restore the lost greenery in the city. Needless to say, this requires active participation from corporations and other stakeholders to expedite the process, shorten deployment period, share resources, build awareness and turn the space into a nature’s haven. On the occasion of International Day of Forests, let’s pledge to work towards conserving and enabling enhancement of such unique green nuclei in Namma Uru, for a healthy co-existence.